Notice the last part of the excerpt. Yusuf said that he "attended meetings in Minnesota," where attendees discussed joining ISIS. Didn't any of the attendees point out that Islam is a religion of peace and tolerance and that ISIS is not Islamic? MINNEAPOLIS (AP)—A Minnesota teenager who had been stopped at the airport as he was trying to travel to Syria pleaded guilty today to one count of conspiracy to provide material support to a foreign terrorist organization. 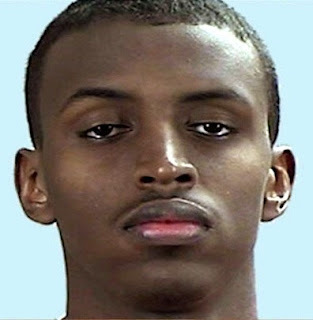 Abdullahi Mohamud Yusuf, 18, admitted in U.S. District Court in Minneapolis that he had intended to go to Syria last May to join the Islamic State group. He faces a maximum of 15 years in prison. No sentencing date has been set. Authorities say a handful of Minnesota residents have traveled to Syria to fight with militants in the last year. At least one Minnesotan has died there. In addition, at least 22 young Somali men have traveled from Minnesota to Somalia since 2007 to join the terrorist group al-Shabab. I do not want to break your heart or any confessed Muslims’ heart that their allah is nothing but garbage of Muhammad's imaginary god to establish his own name as prophet and be king of Arab. You cannot show any other prophet who used God to establish his name as prophet as Muhammad did. Historically God punished false prophet and Muhammad was not an exception. By sever of Muhammad’s aorta as we find in hadith it is proven that he was a false prophet. You and all Muslims after your death will be thrown into lake of burning sulfur along with your false prophet Muhammad. Your allah is evil power. Look at Islamic history past and present, do you see any glory of God, other than destruction of Evil. Pakistan, Afghanistan, Middle East, Africa etc. are support of my statement that Islam is a religion of Evil. Islamic evil leader Osama Bin laden was buried at the bottom of Arabian Sea. Your allah could not save his life for the crime Osama committed by the name of your allah. It is sad but true. Bosnian Muslims were saved by NATO bombing, not by your allah. No good came out of Islam other than war. Beware of wolf in sheep’s clothing, Osama. Some good wording or action you may find in Quran and Hadith, it is nothing but sheep’s clothing to cover up Muhammad’s blood thirsty character. Christ loves you, but hates your false teaching. Do not worship false god your allah and his prophet. At the end everything would be clear when evil will be defeated by God Almighty. The case of the Uraynian shepherds whose hands and feet were cut off, because the stole the camels of the profeet. profeet get a hold of them in the first place? Well was it not the stolen goods of others so called booty which allah gave to him? It was not the “earnings” of honest work but the result of criminal activity. Do not steal what was STOLEN by the Muslim profeet.